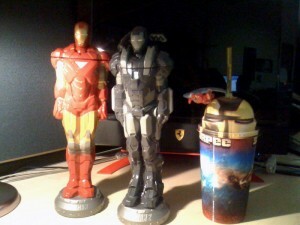 Ok, so I walked to 7-11 today, and from ten yards out I know I was going to drop some cash on my inner geek. 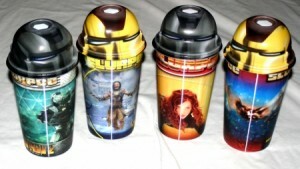 They had these Iron Man and War Machine statuesque Slurpee bottles, four holograpic cups with “helmet” lids, three crazy-straws with War Machine, Iron Man and Whiplash, and four non holographic collectors cups. 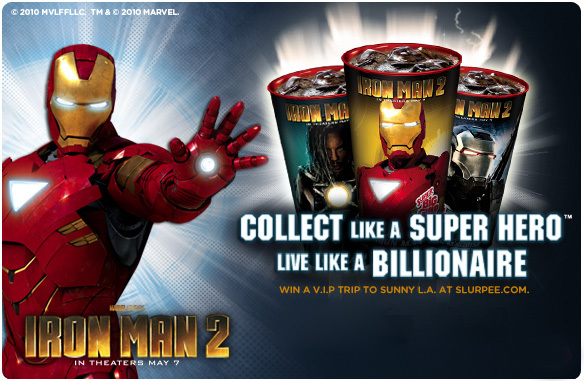 Iron Man is flying on top of my Slurpee! How over the top is that!? This is why I place my hand over my heart during the pledge of allegiance. Check out Iron Man flying on the straw! audience. Check out the commercial, it speaks to the target demo perfectly. I won’t be drinking from my “statue” bottles, instead they will be guarding computer at work, since I don’t think my girlfriend would allow them in the apartment. Now if only I could get my hands on a life-size helmet… uh oh.